The manufacturing index rose by only 0.7% year-on-year in August, undershooting the consensus estimate of 3.1% growth. This is the slowest rate of growth since April 2017. Meanwhile, July growth was revised up to 4.9% from the initial estimate of 4.6%. Manufacturing capacity utilisation also dipped to 65.9% in August from 66.9% in July (revised from 67.2% initial estimate), the lowest since last November. 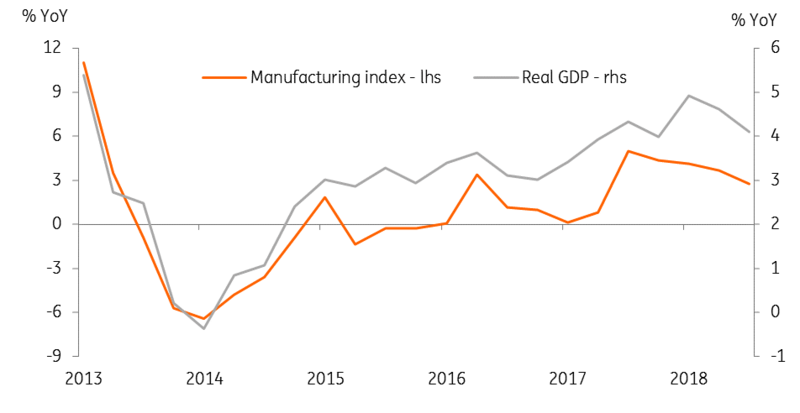 Although the year-on-year manufacturing slowdown can be blamed on a technical factor due to a high base-year effect, the month-on-month growth performance was barely positive (0.2%) after two months of contraction in June and July. This contrasts with a strong double-digit export bounce in August, which more than recovered the monthly declines in the previous two months. This leads us to think that domestic demand was a weak spot for manufacturers in the last month. Assuming a monthly manufacturing change in September at the average rate over the last three years, the 3Q18 growth will see a slowdown to 2.8% from 3.7% in 2Q. Where manufacturing goes GDP follows (see figure). We estimate that the 3Q GDP slowdown to 4.1% from 4.6% in 2Q remains on track. Aside from the GDP growth slowdown, we believe inflation also peaked in August. The Thai baht has continued to outperform due to the still large current account despite two consecutive months of merchandise trade deficit in the last month. These factors significantly weaken the argument for the Bank of Thailand moving to a tighter stance. Moreover, the BoT policymakers are conceding to the need for continued policy accommodation. Just yesterday, a Bloomberg report quoted Governor Veerathai saying that monetary policy was data-dependent and was unlikely to shift to tightening from an accommodative stance.